Sometimes, it’s worth paying for something authentic. It just is. Millennials have recently discovered what their elders have known for decades: sometimes it’s worth paying more. It’s worth paying more for a high-quality recording. It’s worth paying more for a good cup of coffee or glass of whiskey. It’s even worth paying more for something truly crafted instead of something that’s produced in a factory in the far East. That’s probably the biggest thing about this Televes antenna — it’s produced one at a time in a factory in Santiago de Compostela, Spain. Now, it’s still assembled by robots, but one-by-one… not on an assembly line. Every antenna is checked with sophisticated cameras, just like a luxury car. Every one has guaranteed performance. It’s worth building it right if you have to put it outside on your roof. Obviously you don’t want to climb up on the roof every time there’s a storm. 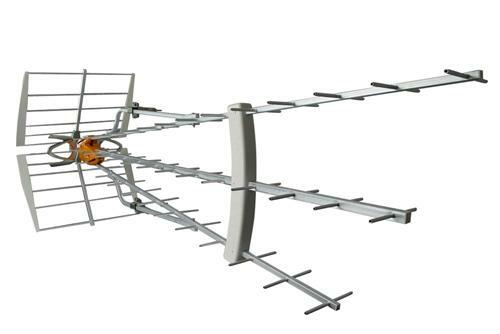 With a Televes antenna, you get high-quality, thick, laminated aluminum that withstands the elements. You get plastic that won’t turn to powder. You get electronics that can take high temperatures and low ones, and won’t fail. You get an antenna that goes up on the roof and stays there, doing its job year after year. When you’ve finally reached the point in your life where you’re going to stay put a while, you need an antenna that will do the same. It really does pull in more channels. A big outdoor antenna pulls in stations from far away. This is simple physics — as signals get weaker you need a bigger antenna to pull them in. A dime-store antenna may work if you’re in the middle of a city — heck a coathanger would work in those circumstances. But once you’re 15-20 miles away from the broadcast towers, you’ll need a bigger antenna. One like this Televes DATBOSS Mix LR will pull in practically every possible signal. Some signals just get too weak or they are so far away that the very curvature of the earth becomes a problem, but short of that, this antenna will get every signal out there. Trust… it takes time to build. You may not have heard of the Televes Corporation who make this antenna, but they have been working to improve TV reception in Spain since 1958. They spread slowly across Europe to become the preferred brand in over-the-air reception and commercial products, and they finally crossed the Atlantic Ocean in the late 2000s with products specifically designed for our shores. They are so serious that they even develop their own meters to test their antennas! Solid Signal has partnered with Televes to develop new and innovative products and the one thing that always comes out is the high degree of quality and the professionalism of the people. This is a company that’s worth paying a little extra to be in business with. It says a lot about Televes products that Chinese factories copy them more than any other antennas. Think about that — the Chinese folks may be copying someone else’s designs, that’s what they’re known for, but they usually copy from the best! At the end of the day, you have a choice. You can buy a cheap antenna and then when it breaks, shop for another one. You can buy an antenna that doesn’t get the job done, and get frustrated when it doesn’t work. Or, you can realize that it is worth a few extra dollars to do it right the first time. When you get to that point, try a Televes antenna and you’ll be glad you did.